This video inspirers me to be great, do great and to never give up. First blogs are always nervous. But second blogs? Second blogs jump right into the fray. They’re the brave ones who ask beautiful people to dance. So what are we waiting for? Let’s dance. Who should we ask? The song’s done, but the party’s not over. So stay awhile. 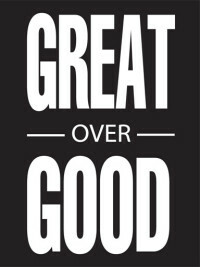 Great Over Good is a Southern California studio that hosts events, holds workshops, features local artists and supports the artistic community. There’s nothing quite like it in Orange County. For more information on Great Over Good event space bookings, upcoming workshops, resident artists or how to get involved, contact the Creative Director, Naadine Koi, at info@greatovergood.com.